A pocket-size three-dimensional printer that makes on-the-go clothing repairs a cinch is just one of 35 visionary concepts that could make for a greener “home of the future.” A semi-finalist in this year’s Electrolux Design Lab, an annual competition that solicited more than 1,700 submissions from student designers around the world in 2014 alone, the wand-like “Fabric Pen” offers a quick way to mend rips or repurpose tired threads in a waste-free way. Made a mistake? You can remove and dissolve existing patches and start over, says Kaz?nait?. Electrolux will choose its top six finalists in October. The first-prize winner, to be announced at a gala in November, will receive €5,000 (about $6,800) and a six-month paid internship at an Electrolux global design center. A pocket-size three-dimensional printer that makes on-the-go clothing repairs a cinch is just one of 35 visionary concepts that could make for a greener "home of the future." 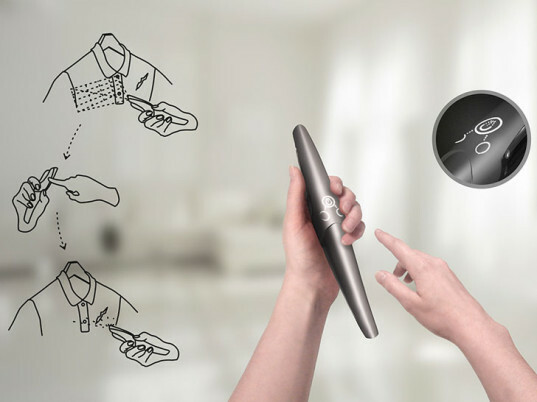 A semi-finalist in this year's Electrolux Design Lab, an annual competition that solicited more than 1,700 submissions from student designers around the world in 2014 alone, the wand-like "Fabric Pen" offers a quick way to mend rips or repurpose tired threads in a waste-free way.